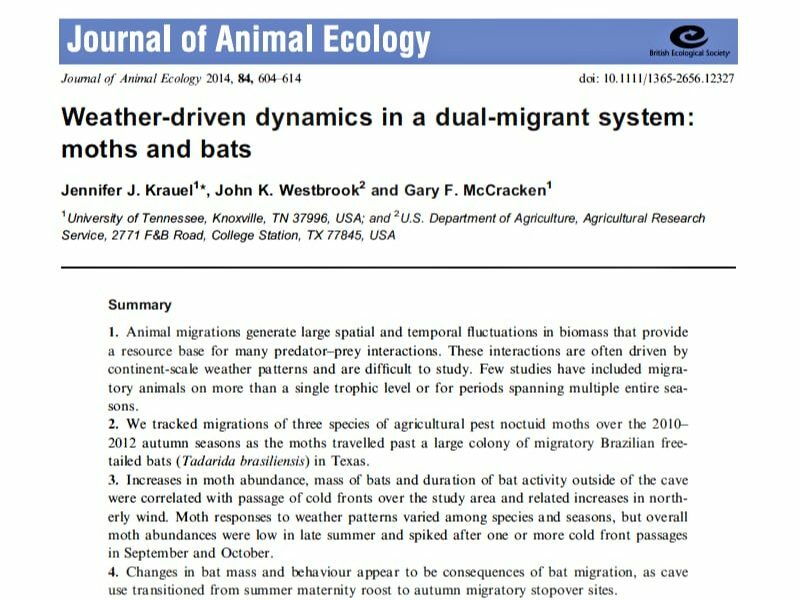 The core of my dissertation research was to understand the mechanisms driving fall migration in both moths that are agricultural pests and in the insectivorous bats that eat them. Now you can read the primary results in this paper from the Journal of Animal Ecology. While I can’t share the final formatted paper, the version you can download here is the last review version, with just a few formatting changes from the final. 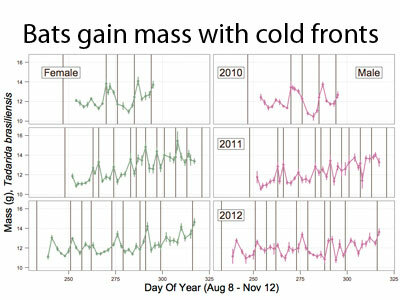 This paper explores the role of weather, or specifically cold fronts as a mechanism driving autumn migration in both bats and moths in Texas. The moths in question are from the family Noctuidae, specifically corn earworm, fall armyworm, and cabbage looper. The larval forms of these moths cause considerable damage to crops. In spring, over multiple generations the moths move northward across the continent following ripening crops, but in fall it appears the adults return southward in a single generation. The bats I studied are Brazilian free-tailed bats, roosting in huge colonies in Texas caves in the summer, and returning south into Mexico in the fall. Average mass of 25 bats caught each day during the fall season at Frio Cave, Uvalde Co. Texas. Vertical lines represent cold front passage. 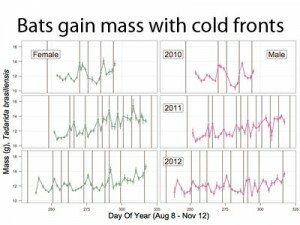 I did find that weather, and cold front passage specifically, was a significant factor explaining patterns in moth counts and changes in bat mass. Of course, it’s ecology, with so many variables involved that actually proving anything is going to be impossible. However, there are a few curious pieces that appear to fit together into a picture with big implications for possible effects of climate change. September and October are very dry and dusty times in south Texas with little vegetation to support insects for bats to feed on. 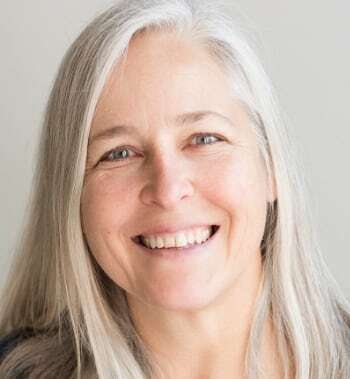 At the same time, the bats are at their lowest weight after their pups fledge, and they must somehow get fat before they can head south themselves. It may not be coincidence, then, that streams of fat moths appear just when the bats need them the most. What will happen if things get even hotter and drier, or the cycle of cold fronts shifts? If the moths come later, will the bats even be able to fly south in time? The next part of this project is to figure out if the bats are actually eating these moths as they pass through. I’ve extracted insect DNA from thousands of samples of bat guano, and next I want to see if I can show a more direct link between migratory predator and migratory prey. But first, I’m working on another migratory bat project.